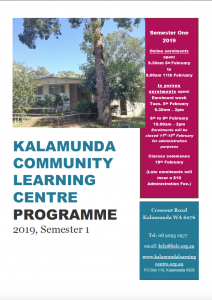 The programme of the courses available at Kalamunda Community Learning Centre for Semester 1, 2019 is now available. Please note that both the timetable and programme were correct at the time of publishing / printing and both are subject to change prior to the semester commencing. For a quick glance guide to the courses available in Semester 1, 2019, please view the Centre’s Timetable.